Following yesterday’s Best Alternative Music Album nomination from Recording Academy / GRAMMYs for The Hope Six Demolition Project, PJ Harvey will embark on her most extensive North American headline tour in more than ten years. Pre-sale tickets will be available on Thursday, December 8th. General on-sale will commence on Friday, December 9th at 10am ET with the exception of Brooklyn and San Francisco dates which will go on sale Friday, December 16th. For full details visit http://www.pjharvey.net. Following on from the Mercury Prize winning album Let England Shake, PJ Harvey returned this year with a new record documenting a unique artistic journey, which took her to Kosovo, Afghanistan and Washington, D.C. The album was recorded during her month long residency at Somerset House, “Recording in Progress”, in which audiences were given the opportunity to see Harvey at work with her band and producers in a purpose-built studio. The Hope Six Demolition Project reached #1 on the UK charts and she returned to the US for sold out shows in Los Angeles and New York. PJ's nomination for Best Alternative Music Album is her 7th GRAMMY® nomination and her first in 12 years! PJ Harvey Shares New Track "Guilty"
Today, PJ Harvey has released a new song titled “Guilty” which is taken from the sessions that produced her current album, The Hope Six Demolition Project. The sessions took place in January 2015 during Harvey's month long residency at London’s Somerset House--“Recording in Progress”—in which audiences were given the opportunity to see her at work with her band and producers in a purpose-built studio. As previously reported, PJ Harvey will return to the U.S. next month for the first time since her tour for 2011’s acclaimed Let England Shake, playing two dates: August 16 at Terminal 5 in New York City and August 18 at Shrine Expo Hall in Los Angeles. PJ Harvey will play 17 headline dates across the UK and Europe later this year, including two shows at London’s Brixton Academy in October, followed by Glasgow, Manchester and Wolverhampton. Directed by renowned British theatre director Ian Rickson, dressed by Ann Demeulemeester, and with lighting by Adam Silverman and set design by multi-media artist Jeremy Herbert, the show is receiving fantastic reviews around the world. From the moment the 10 strong band march onto the stage playing their instruments, the audience is transported into a truly unique concert experience; powerful, enchanting, thought provoking, joyous, and beautifully crafted, filled with songs that are a reflection of our times. Harvey is joined by long-time collaborators John Parish, Mick Harvey, and Jean-Marc Butty, and friends Alain Johannes, Terry Edwards, James Johnston, Kenrick Rowe, Alessandro Stefana and Enrico Gabrielli. The full list of newly confirmed UK/Europe dates, including two festivals can be found HERE. PJ Harvey’s ninth studio album, The Hope Six Demolition Project, is available today! PJ Harvey Shares New Single "The Community of Hope"
“The Community of Hope” is the second single taken from PJ Harvey’s forthcoming album, The Hope Six Demolition Project which hits stores on April 15th. Hear the track below. The Hope Six Demolition Project draws from several journeys undertaken by Harvey, who spent time in Kosovo, Afghanistan and Washington, D.C. over a four-year period. The album was recorded last year in residency at London's Somerset House and is produced by Flood and John Parish. Both singles from The Hope Six Demolition Project, ‘The Wheel’ and ‘The Community of Hope’, are available instantly via iTunes when pre-ordering the album. PJ Harvey and her band will perform a number of festival dates across Europe this summer, including London’s Field Day on Sunday 12th June, and a return to Glastonbury on Sunday 26th June, twelve years after her last appearance at Worthy Farm. See all dates HERE. PJ Harvey Debuts New Video For "The Wheel"
"Polly and I wanted to initiate a project together working in places we thought interesting and relevant. We met through her seeing my photographs from Afghanistan, and I later showed her more work, including some from the war in Kosovo in the late 1990s. I had experience and contacts in both places and Polly had long held a fascination for Afghanistan and was caught up following the events in Kosovo when it was topical. Both had troubled histories and because of the news were familiar in name to everybody; the detail and nuance was maybe lacking or forgotten. I had returned to Kosovo in 2004 when the conflict erupted again, finding unresolved disputes and a deep frustration on every side with the pace and handling of events. "An invitation came to both of us early in the summer of 2011. We were asked to attend a screening of the complete 12 Short Films I had made for the Let England Shake album, and to be part of a Q and A afterwards at the Dokufest in Prizren, southern Kosovo. Not something Polly would normally do, yet there was something inevitable about it all and it would get the project started. So we went. "The song 'The Wheel' has the journey to Kosovo at its center. Who is to say what else has influenced and informed its creation? The sight of a revolving fairground wheel in Fushe Kosove/Kosovo Polje near the capital Pristina is the concrete reference point for the title. I can tell you its date—4th August 2011—from the piece of footage I made as we walked up the street to our parked car near the train station. It was a passing observation of a commonplace image, one of many that day. While Polly took notes I might have been more interested in something else happening across the street and not bothered to shoot or even have seen it. That day we were gathering material in a blind, optimistic endeavor; characteristic of the way we tend to work together. We had no idea if any of it would ever be seen, heard or would make sense. "Was that sight alone the inspiration for the song? Without being told the stories of people who had suffered during the war, without visiting villages abandoned through ethnic cleansing and cycles of vengeance, without experiencing the different perceptions of people with shared histories, could the song have been written? "I made a return trip to Kosovo in December 2015, armed this time with the knowledge of how the project had developed. In addition to Kosovo, there had been journeys to Afghanistan and Washington D.C. A book, The Hollow of the Hand, had been published of Polly’s poems and my photographs and a words/images/music launch on the stage of the Royal Festival Hall over two nights. A recording session turned art installation in Somerset House which I filmed. The album was mastered and on its way. Disparate elements finally coming together of a project that started with the premise of curiosity and interest. "Making the film for 'The Wheel' involved a mix of footage from the first trip in 2011, rehearsals I shot of Polly in London and the most recent trip to Kosovo. The enormous refugee crisis in Europe had been news for months. I spent some time on the Greek and Macedonian borders, and in Serbia, before traveling into Kosovo. It was happening in and through territories associated with recent conflicts in Kosovo and the wider Balkans. The idea of cycles, wheels and repetition once again being all too apparent and necessary to make. "We salute the life of Nesim Kryeziu (1938-2016) the wonderful man in the film performing a traditional dance with a glass of water on his head at a wedding in his village of Brezne in the Opoja region of Kosovo." Head HERE or jump below to watch the video. This spring sees the release of PJ Harvey’s ninth studio album, The Hope Six Demolition Project, on April 15th through Vagrant Records in the US. Watch this new album trailer by Seamus Murphy featuring tracks “The Community of Hope” and “The Wheel” HERE. PJ Harvey’s Let England Shake [iTunes Link] has been nominated for a BRIT Award in the prestigious Best British Album Category! This nomination comes after the album was awarded the Mercury Prize for Album of the Year, in addition to a slew of album of the year honors by numerous music publications. Let England Shake - 12 Short Stories by Seamus Murphy, a limited edition DVD which hits stores on January 31st, is now available for pre-order in the US! Using only natural light and combining live documentary style footage with still photographs, award winning Irish documentary photographer Seamus Murphy created a stunning short film for each of the tracks on the award winning Let England Shake. Click HERE to pre-order the DVD and watch out to see if Let England Shake takes home the Best British Album at BRIT Awards 2012 on February 21st! PJ Harvey’s second of two sold-out shows at London’s Royal Albert Hall on Monday, October 31 will be streamed live via PJHarvey.net, Facebook.com/pjharvey, and Guardian.co.uk. The concert will be streamed in real-time, in HD audio and video, by LoveLive and available worldwide. Access codes for the live stream are available to purchase HERE. The Royal Albert Hall shows on Sunday, October 30 and Monday, October 31 are the first appearances at this historic London venue for two-time Mercury Prize winner PJ Harvey, and her last UK shows of 2011. Harvey will be playing material from her critically acclaimed album Let England Shake [iTunes link] and past albums, with a live band comprising of Mick Harvey, John Parish and Jean-Marc Butty. The new iTunes Session from recent Mercury Prize 2011 winner PJ Harvey is available today! The EP features seven recently recorded live tracks along with an interview with the songwriter and musician. The iTunes Session includes four songs from her most recent album Let England Shake as well as three of her most widely acclaimed songs from past albums. Click HERE to purchase on iTunes for just $6.99. PJ Harvey has won the UK’s 2011 Mercury Music Prize for her eighth studio album, Let England Shake, and is now the first person to win the award twice. This was Harvey’s fourth nomination; she was previously nominated for Rid of Me in 1993 and To Bring You My Love in 1995, and in 2001 she won the award with Stories From The City, Stories From The Sea. She accepted the award from her hotel room in Washington DC on September 11, 2001. "It's really good to be here as when I last won 10 years ago on September 11 I was in DC watching the Pentagon burn from my hotel room," she told the audience at the awards ceremony in London last night. This latest nomination also marks 10 years since she became the first female to win the Mercury prize and Harvey now stands alongside Radiohead as the most nominated artist in the prize’s history. In the press room after the awards, PJ Harvey said, “I think there is a connection between what happened 10 years ago and the content of this album, in a certain way. Obviously this record that I’ve won with is largely about the wars that we’re involved in, contemporary wars, but also, I wanted in a way for it to be timeless, because we’ve always been involved in wars. But I think that the greater urgency that I felt to write an album about this now is because of the result of what has happened in the last ten years. On September 12, 2011, PJ Harvey will release an exclusive iTunes Session which can be pre-ordered now on iTunes. The EP features seven recently recorded live tracks along with an interview with the songwriter and musician. The Session includes four songs from her most recent album as well as three of her most widely acclaimed songs from past albums. Watch PJ Harvey's performance of "The Words That Maketh Murder" at last night's award ceremony below. PJ Harvey's exclusive iTunes Session pre-order starts today on the iTunes Store. The EP features seven recently recorded live tracks along with an interview with the songwriter and musician, PJ Harvey. The Session includes four songs from her most recent album, Let England Shake, as well as three of her most widely acclaimed songs from past albums. Let England Shake is PJ Harvey’s eighth studio album and was recently nominated for the 2011 Mercury Music Prize. This is Harvey’s fourth nomination; she was previously nominated for Rid of Me in 1993 and To Bring You My Love in 1995, and in 2001 she won the award with Stories From The City, Stories From The Sea. She accepted the award from her hotel room in Washington, DC on September 11, 2001. This latest nomination also marks 10 years since Harvey became the first female to win the Mercury prize and Harvey now stands alongside Radiohead as the most nominated artist in the prize’s history. The Awards take place tomorrow, Tuesday, September 6, 2011. PJ Harvey’s eighth studio album, Let England Shake, has been nominated for the 2011 Mercury Music Prize. This is Harvey’s fourth nomination; she was previously nominated for Rid of Me in 1993 and To Bring You My Love in 1995, and in 2001 she won the award with Stories From The City, Stories From The Sea. She accepted the award from her hotel room in Washington DC on September 11, 2001. Released in February, Let England Shake is the fastest selling record of Harvey’s career featuring long-standing collaborators Flood, John Parish, Mick Harvey and Jean-Marc Butty. On release, Let England Shake received 10 out of 10 in the NME, “this deathly sombre but sweetly sung anti war record might just be Polly’s most affecting and impressive work so far”. Earlier this year, PJ Harvey received the Outstanding Contribution to Music at the NME Awards. She is currently on a festival tour in Europe including a sold out gig at Alexandra Palace (as part of the Portishead curated ATP) on Saturday, July 23. Vanity Fair has just premiered the Seamus Murphy directed short film for PJ Harvey's "All And Everyone" on their blog. The video is the final piece in the 12 part visual accompaniment to PJ's new album Let England Shake (iTunes link). You can watch the new video below and click HERE to read the full article on VF. The previously released films can be seen on PJ's official site HERE. PJ Harvey recently stopped by The Guardian's studio to perform Let England Shake track "The Last Living Rose" for part of their How I wrote… live session series. You can watch the video of the performance HERE, and read PJ's exclusive interview with the UK publication HERE. NPR Music's All Songs Considered have just posted a full recording of PJ Harvey's performance at the Warfield Theater last Thursday in San Francisco. Click HERE to listen to PJ "Live In Concert", featuring performances of the entire new album Let England Shake, as well as a few favorites from her previous works. The next Seamus Murphey short film to accompany PJ Harvey's new album Let England Shake has just premiered on The Huffington Post. Watch the video below or click HERE to view it on HuffPo. Did you catch PJ Harvey last night on Conan? Well even if you missed it, you can now watch the performance of "The Last Living Rose" below, or over on TeamCoco. Enjoy! The Seamus Murphy directed short film for PJ Harvey's "On Battleship Hill" has just premiered over on NPR's All Songs Considered. You can view the new video below, and watch the previously released films from the 12 part Let England Shake accompaniment HERE. The Seamus Murphy directed short film for PJ Harvey's "Hanging In The Wire" has just premiered exclusively on RollingStone.com! Click HERE to view the video and read what the British photographer had to say about creating the piece. The Seamus Murphy directed short-film for PJ Harvey's "England" has just premiered over at AOL Spinner. You can check out the new video below, and click HERE to see all the Let England Shake videos released thus far on YouTube. There is also an exclusive interview PJ did with AOL HERE. Enjoy! PJ Harvey premieres new video on MTV, win VIP tickets to Coachella from PJ & KCRW! As part of MTV's Indie Music Month, PJ Harvey has just premiered the new Seamus-Muphy-directed short film for "The Colour of the Earth"! Check out the new video below, which starts off with an a cappella performance of the song before jumping into the Let England Shake album track. In other PJ news, KCRW is giving away 2 VIP passes to the sold-out Coachella festival on our behalf! Click HERE to become a KCRW member for your chance to win! Win a trip to NYC to see PJ Harvey from SiriusXMU! Sirius XMU is giving one lucky listener the chance to experience PJ Harvey, live at her sold out New York City concert at Terminal 5! One winner will receive two nights hotel, round-trip airfare to NYC, and two tickets to watch PJ Harvey perform songs spanning her entire catalog including the latest critically acclaimed album Let England Shake. Click HERE to enter! The new Seamus Murphy directed short film for PJ Harvey's "The Glorious Land" has just premiered on MSN Music! You can click HERE to check it out and click HERE to purchase the new album Let England Shake on iTunes. Anthony Fantano from the needle drop did a video review of PJ Harvey's new album, Let England Shake. He discussed his thoughts on PJ's vocal style, his favorite track, "England", the song subjects, and more. Check out the video below. PJ Harvey and James Vincent McMorrow sale on Amazon! Get PJ Harvey's new album, Let England Shake for $7.99 and James Vincent McMorrow's album, Early In The Morning for just $8.99! Scroll over the album below and buy now! PJ Harvey's Critically Acclaimed New Album, LET ENGLAND SHAKE, is Available Now! 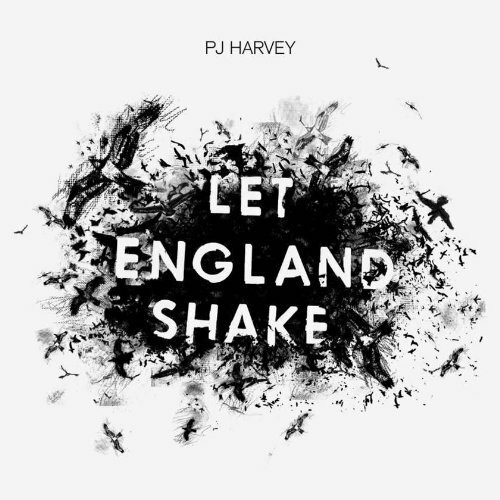 Click HERE to head to iTunes to purchase PJ Harvey's critically acclaimed new album, Let England Shake. The album has been declared "Best New Music" by Pitchfork. Click HERE to check out the brand new video for the song "Let England Shake". PJ Harvey was interviewed on NPR's Fresh Air earlier today to discuss her new album, Let England Shake with WHYY's Terry Gross. PJ talked about the research that went into writing the album, as well as her musical and instrumental decisions. She also mentions how her childhood and parents influences her work. In case you missed it, you can now listen to the in-depth interview below. Pitchfork has just premiered the latest short film, once again directed by Seamus Murphy, for the title track of PJ Harvey's forthcoming album Let England Shake. You can watch the video below, and click HERE for the full article. Let England Shake becomes available tomorrow! Click HERE to pre-order on iTunes. And don't forget that today at 8pm GMT (3pm EST/12pm PST) PJ will be performing via a live webcast from Paris at PJHarvey.net ! PJ Harvey Live Webcast from Paris on Monday! Let England Shake becomes available tomorrow! Click HERE to pre-order on iTunes. To mark the release of Let England Shake, PJ Harvey will debut her new album live in a one-off, special show from Paris next Monday February 14th. The show will be streamed live on Monday night at 8pm GMT (3pm EST/12pm PST) by the French music site Deezer and the cultural channel ARTE. Harvey will play two sold out shows at The Troxy in London later this month, as well as sold-out dates in Brussels, Berlin, and Paris. April will see Harvey return to the States for her debut Coachella performance and sold out shows in New York and San Francisco. Stream PJ Harvey's New Album In Its Entirety on NPR.com! PJ Harvey's forthcoming album Let England Shake may not come out until next week (2/15), but thanks to NPR Music's First Listen you can now stream the album in its entirety on NPR.com! Click HERE to listen to the full album and HERE to preorder Let England Shake on iTunes. Pj Harvey talks about things that inspire her, her songwriting, and recording process for her new album, 'Let England Shake'. PJ Harvey discusses the influences and her studies on the subject of war, humanity, nature, and politics in her songs. PJ Harvey has confirmed two U.S. headline shows in addition to her appearance at the already sold out Coachella festival. The headline dates—April 14 at the Warfield Theater in San Francisco and April 20 at Terminal 5 in New York—fall on either side of the April 17 Coachella set. The San Francisco show is on sale now, click HERE for tickets. New York tickets will go on sale February 4 HERE. PJ Harvey’s eighth studio album, Let England Shake, will be released February 15 in the U.S. by Vagrant Records. The record’s release is already being heralded by some of the most enthusiastic critical notices of her distinguished career: In her native UK, Let England Shake has received 5 star reviews from Q and MOJO, while UNCUT named it Album of the Month. Preorders for Let England Shake are live now at iTunes and Amazon. PJ Harvey’s band for these rare U.S. headline gigs and Coachella will be John Parish, Mick Harvey and Jean-Marc Butty. For further information go to PJHarvey.net. PJ Harvey's Forthcoming Album is Now Up for Pre-order on iTunes! PJ Harvey's new album Let England Shake is now available for pre-order on iTunes! Click HERE to pre-order now and receive an instant download of "Written on the Forehead", plus get the exclusive b-side "The Big Guns Called Me Back Again" when the record drops on February 15th! Watch PJ Harvey's New Video For 'The Words That Maketh Murder' on NPR Music! PJ's highly anticipated new album, Let England Shake, will be available on February 15! Pitchfork has just posted their exclusive interview with PJ Harvey! Click HERE to see what PJ has to say about her influences and creative process her forthcoming album Let England Shake (2/15). Stereogum had the chance to check in with PJ Harvey this week and discuss the new record Let England Shake! Click HERE to give it a read. Happy new year everyone! Excited to be back- PJ Harvey's forthcoming album "Let England Shake" (coming 2/15/11) just made Pitchfork's Guide to Upcoming Releases in Winter 2011! What new records are you looking forward to in the new year?? Tell us on Facebook or Twitter. A short film, directed by the esteemed award-winning photographer Seamus Murphy, will premiere on PJ Harvey’s official web-site pjharvey.net on Monday December 20th. Murphy has directed a series of short films to accompany all 12 songs on Harvey’s new album Let England Shake, ‘The Last Living Rose’ will be the first to air. The 12 films will feature still and moving images from a 5,000 mile road-trip Murphy undertook around England. He has worked similarly with still photography on journeys through America and Russia. Inspired and developed from themes in Harvey’s new album, the films were made in the manner of classic photographic reportage - recording real & spontaneous situations. They make up a visual diary of Murphy’s journey, travelling light and alone, and his attempt to document England and the English. Murphy has mixed his observations on England with images from his work in Afghanistan, Iraq and the Middle East - places Polly refers to in her depiction of England. The film soundtrack, the studio recording of the album Let England Shake, is mixed at times with footage and audio Murphy captured of Harvey in rehearsal and in performance. In addition some of the album lyrics were given a voice by people he encountered on his journey. Let England Shake is set for release on Island Records on 14.02.2011 and Vagrant Records in the US on 15.02.2011. PJ Harvey Debut: "Written On The Forehead"
DEBUT: "Written On The Forehead" by PJ Harvey. Check out the first track from PJ Harvey's upcoming release "Let England Shake," available February 15th. Read more about PJ Harvey and the new track on Pitchfork.com. PJ Harvey's new album Let England Shake coming February 15th on Vagrant Records! PJ Harvey's eighth studio album Let England Shake is set to be released on the February 15, 2011 on Vagrant Records in the U.S.
Let England Shake was recorded in a 19th Century church in Dorset with long time collaborator Flood who co-produced the album with PJ Harvey, John Parish and Mick Harvey. The record was also mixed by Flood. The new album will be supported by a run of sold out live shows early next year, with dates in Brussels, Berlin, Paris, and London's Troxy on February 27th and 28th. 2011 will also see Harvey return to the festival stage, with more details to be announced. PJ Harvey will perform with a live band which includes Mick Harvey, John Parish and Jean-Marc Butty.